The week before this Test, Will and I had been on a stag WEEK in Dublin. During the planning stages of this trip we had both been excited about this prospect. However, the reality was somewhat disappointing. The kindest thing to say is that the rest of our party weren’t much fun. This culminated in a rather drunken Wednesday evening with Will awkwardly falling out with one of the other guys. The following day we sat on the sofa, quite hungover, watching the first day’s play of the second Test whilst the rest of the stag party drove to the other side of Ireland. For us, it was the best day of the week. We had tickets for the third day’s play so flew into Birmingham on the Friday to meet Will’s brother and associates. We immediately had more fun than on the stag. Now despite being a fan since childhood, I had never been to a Test match before so day three was breaking my Test-watching virginity. I was obviously looking forward to this. The sands of time and the flow of ale have somewhat clouded my memory, but this is roughly what I can remember. Bullet point format might be easier here rather than trying to string these flashbacks together in any form of cohesive text. The guy who I sold my spare ticket to made the rather poor decision to leave at lunchtime. To be fair, it wasn’t looking good. A couple of guys dressed as Eighties wrestlers took turns to power slam each other on the walkways. This was met with huge approval by members of the crowd. I danced with a group of strangers at the end of the day’s play behind the Hollies Stand repeatedly singing ‘Michael Vaughan’s Barmy Army!’ (Is this too much cricket chat?) We really did spend a long time doing this. Will got on an Aussie fan bus and started singing songs about Freddie. Price made a rather poor decision to not join us on the town in Birmingham and got the train back to London (Possibly on demand of his then girlfriend). I remember being in the Walkabout and Will having a chat with Jimmy. The following day I undertook a frustrating journey on a train trying to get WAP signal on my phone to find out what was happening. Will had managed to get a ticket for day four and amusingly ended up sitting next to the Aussie fans whose bus he had serenaded the previous evening. Alas, this was before the time of the camera phone so no digital memories were captured. Strangely, such a memorable day doesn’t appear to have that many memories (well, within the boundaries of this reporting format). 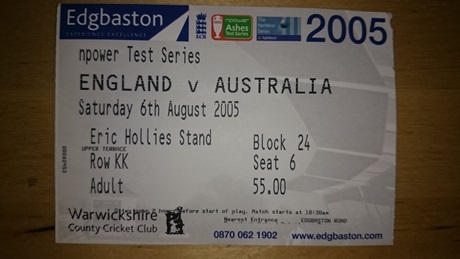 As first experiences of a Test match go however, this was quite good. Also, you neglected to mention that String had originally agreed to have the ticket only to turn it down the week before (he was going flat hunting. What a tool), so you had to sell the ticket on eBay for less than face value. I have reminded String of this repeatedly for the past 10 years. Roll the clock forward ten years and Bert’s failure to show up, jacketed, at the Raglan Stand on Friday, followed by complete radio silence since, in a real worry. My concern is that Bert might have been kidnapped by the dark forces of commercial logistics solutions. Those guys show no mercy once they have got you into a room wearing a jacket; their “pitch” might last many days, perhaps weeks or months. Not everyone emerges from such an experience sane or even alive. The other possibility, of course, is that Bert and his captors started drinking ridiculously fast and early on Friday, just in case the game was to be over in a hurry, then continued at that pace through the teatime denouement and beyond. That was the pattern among those sitting near us in the Raglan Stand. If so, he might simply still be recovering from his hangover. I have received reports that Bert is indeed alive, albeit barely. My sources confirm that he indeed spotted you, Ged, and waved madly, smiled broadly, and walked jauntily toward you when a group of salesmen dressed as corporate-logistics-synergy-solution-green-environment people cornered him. Bert tried convincing them that he was actually an individual-illogical-dysfunctional-problematic-non-recycler, but to no avail. He is now at an undisclosed location trying to see how best he can use an oddly shaped thermos, two blackened oranges, a pair of velvet gloves, and thirty seven strawberry flavoured condoms. Never fear, people. Bert… that is, I am nicely fine thank you all very much. I’ve not been kidnapped and held in a wharehouse just off the A34 near Newbury or any such fanciful thinking, no no no no no. So stop worrying, relax, don’t phone the police, chill out guys. Everything is awesome. Which word were you trying to write, ‘Bert’? OH MY GOD THEY GOT HIM, THEY GOT POOR BERTIE. Changing the subject, here’s a theory. Mark Wood is over-rated. Decent bowler, potential, but everyone seems to be falling over themselves because he’s a nice lad who plays with a smile on his face and gives good quote. Hope I’m wrong, but I wouldn’t mid seeing Plunkett at Trent Bridge instead. …while I was temporarily reassured by Bert’s 20:32 posting, on re-reading it has a Faux-Bert feel to it. I have asked the West Midlands Fuzz to upgrade their police investigations. They assure me that the full force of their flying squad will be deployed, as soon as they both can find their bicycle clips. Are we all agreed that Bert is not in a whorehouse just outside Newbury? But why would he mention Newbury? I think I’m starting to see the connection now between the whore house and the retail logistics concepts. It’s all about positioning.